Speedy filly Kuchinskaya was a raging hot favourite in the opening event at the ATC metropolitan meeting at Wyong last Wednesday, but the Ingham Racing owned Here de Princess went past her like she was tied to the fence. An impressive winner on debut at the start of the month at the same venue when she caught our eye and was the 'One to Watch' of the day, Here de Princess proved that win was no fluke when she produced another top effort to score again. Ridden quietly by Corey Brown in the small field of four, Here de Princess stalked the leaders and then rounded them up in the straight to dash clear and win the 1000 metre Benchmark 70 event nearly five lengths in a slick 57.39 seconds. "She's been impressive at both starts, but I've got say she shows nothing at home and has just kept surprising us," Chris Waller revealed. "I thought about ringing the stewards this morning as she hadn't really pleased me coming into the race, but then I thought she wasn't going to be favourite anyway, so decided to leave it and am glad I did." Corey Brown has been aboard the filly at each of her wins and has a good opinion of the daughter of Dehere (USA). "She's a timid horse that looks at things a lot, but the way she hit the line first up made me think she could do it again today," Brown said. "I'm not surprised she won, but I was surprised at how quick she went when I gave her a squeeze." Here de Princess (pictured as a yearling) was purchased by Ingham Racing for $100,000 from the Amarina Farm draft at the 2011 Magic Millions. The compact chestnut is the first winner for Princess Pedrille, a half-sister by Desert Prince (IRE) to Group II winner O'Lonhro from top class Group II winning mare Mamzelle Pedrille. 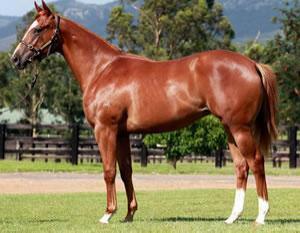 Delbridge Racing has a 2-y-old colt by Dehere in work at Flemington with top trainer Mark Kavanagh.